Toppy pallet changer, pallet turner, pallet inverter. Our pallet changers, also known as pallet turners or pallet inverter, allow the replacement of wooden pallets with plastic or aluminium pallets and with other kinds of pallets used by the customer. In the same easy way, the pallets used in the production area can be changed with not returnable wooden pallets (good for stocking and shipping). 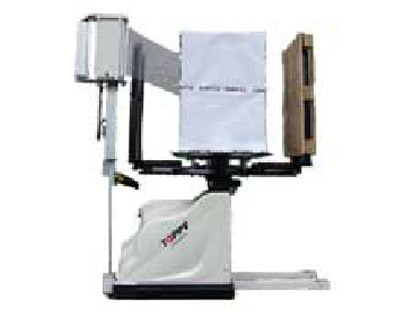 Toppy Srl offers the widest range of pallet changing equipments under banner of flexibility: you will always find a Toppy machine suitable to your load, to your kind of pallet and to the room at your disposal. Some of our pallet changers are movable, with the undeniable convenience of replacing the pallet anywhere in the factory. On the other hand, a stationary pallet inverter will guarantee utmost performance and excellent versatility, the simpler stand alone machine as well as the powerful and complex logistic system. Toppy Pharma Advance pallet changer can lift and turn loads up to 1000 Kg. The max. possible height of the load is 1550 mm (pallet included). Like any Toppy equipment, it complies with the strictest European and American rules and pays special attention to the GMPs, with its smooth surface and bevelled shape assuring the utmost hygiene and cleanliness. Toppy Pharma Advance WB pallet changer can lift and turn loads up to 1000 Kg. The max. possible height of the load is 1550 mm (pallet included). Like any Toppy equipment, Toppy Pharma Advance WB complies with the strictest European and American rules and pays special attention to the GMPs, with its smooth surface and bevelled shape assuring the utmost hygiene and cleanliness. Toppy Pharma Advance WB pallet changer is realized with wide base of the legs, so that it is possible to pick up also pallets closed at the base (for instance, UK pallets). Maxi Toppy Pharma Advance pallet changer can lift and turn loads up to 1500 Kg. The max. possible height of the load is 1780 mm (pallet included). Like any Toppy equipment, Maxi Toppy Pharma Advance complies with the strictest European and American rules and pays special attention to the GMPs, with its smooth surface and bevelled shape assuring the utmost hygiene and cleanliness. Maxi Toppy Pharma Advance WB pallet changer can lift and turn loads up to 1500 Kg. The max. possible height of the load is 1780 mm (pallet included). Like any Toppy equipment, Maxi Toppy Pharma Advance WB complies with the strictest European and American rules and pays special attention to the GMPs, with its smooth surface and bevelled shape assuring the utmost hygiene and cleanliness. Maxi Toppy Pharma Advance WB pallet changers is realized with wide base of the legs, so that it is possible to pick up also pallets closed at the base (for instance, UK pallets). Maxi Toppy Pharma Plus pallet changer can lift and turn loads up to 1500 Kg. The max. possible height of the load is 2370 mm (pallet included). Like any Toppy equipment, Maxi Toppy Pharma Plus complies with the strictest European and American rules and pays special attention to the GMPs, with its smooth surface and bevelled shape assuring the utmost hygiene and cleanliness. Maxi Toppy Pharma WB Plus pallet changer can lift and turn loads up to 1500 Kg. The max. possible height of the load is 2370 mm (pallet included). Like any Toppy equipment, Maxi Toppy Pharma WB Plus complies with the strictest European and American rules and pays special attention to the GMPs, with its smooth surface and bevelled shape assuring the utmost hygiene and cleanliness. Maxi Toppy Pharma WB Plus pallet changer is realized with wide base of the legs, so that it is possible to pick up also pallets closed at the base (for instance, UK pallets). Toppy Pharma WB Dual Press pallet changer can lift and turn loads up to 1000 Kg. The max. possible height of the load is 1550 mm (pallet included). Like any Toppy equipment, Toppy Pharma WB Dual Press complies with the strictest European and American rules and pays special attention to the GMPs, with its smooth surface and bevelled shape assuring the utmost hygiene and cleanliness. 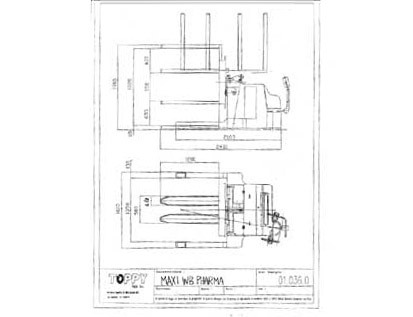 -	Side pressure (no turning) for finished products, like boxes or drums. This model is realized with wide base of the legs, so that it is possible to pick up also pallets closed at the base (for instance, UK pallets). Maxi Toppy Pharma WB Dual Press pallet changer can lift and turn loads up to 1500 Kg. The max. possible height of the load is 1780 mm (pallet included). Like any Toppy equipment, Maxi Toppy Pharma WB Dual Press complies with the strictest European and American rules and pays special attention to the GMPs, with its smooth surface and bevelled shape assuring the utmost hygiene and cleanliness. Toppy Side Press is a mobile pallet changer for the replacement of pallets up to 800 Kg and no height limitation. The pallet replacement takes place without turning the load, through a lateral pressure of the product. This machine features two rubber-covered side compactors, that keep the product steady while the pallet is taken out from below and replaced. Like any Toppy equipment, Toppy Side Press pallet inverter / pallet changer complies with the strictest European and American rules and pays special attention to the GMPs, with its smooth surface and bevelled shape assuring the utmost hygiene and cleanliness. 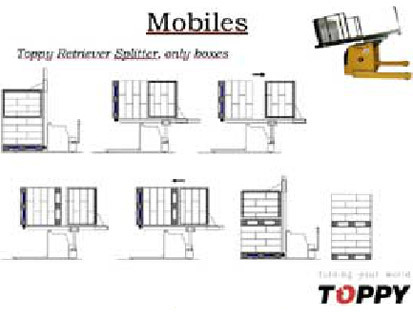 Toppy Retriever is a mobile pallet changer for the replacement of pallets of different sizes and maximum height 2000 mm, suitable to loads of boxes. The load is tilted by 90° (partial turning). The pallet will be taken out and replaced from the load lower side. 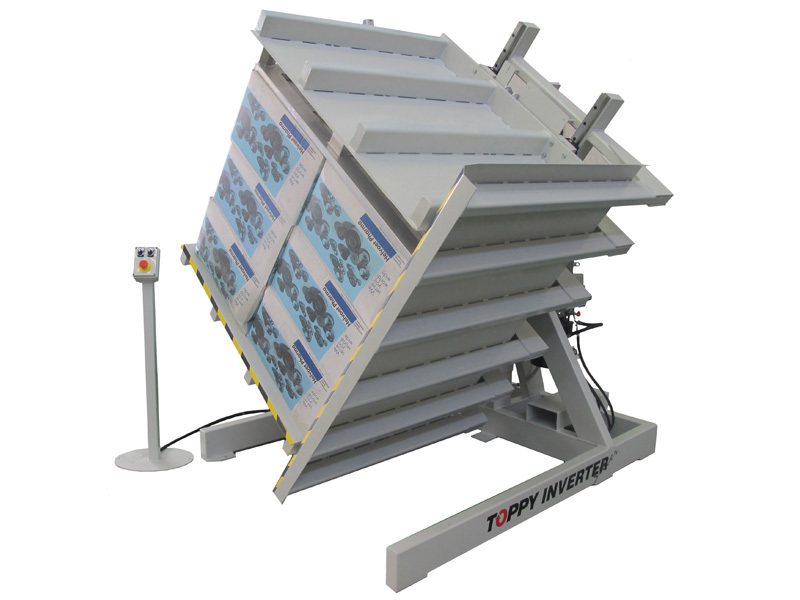 Like any Toppy equipment, Toppy Retriever pallet inverter complies with the strictest European and American rules and pays special attention to the GMPs, with its smooth surface and bevelled shape assuring the utmost hygiene and cleanliness. Toppy Stretch is the first and only system, covered by an international patent, allowing to get load protection through a complete wrapping. In this way, a protective effect against any atmospherical and bacterial agent, as well as against dust attacks, is achieved. Thanks to such revolutionary system the load will be totally safe from water, damp and dust, which will make it possible to store goods outdoor and save a lot of warehouse room. Toppy Stretch can be used also with the Toppy plastic supports, replacing the traditional wooden pallets, with evident economic and ecological saving. The load is tilted by a turning platform placed between the two forks, allowing the plastic film to wrap the load on its four sides (which the traditional wrappers can’t do). Toppy Octabin is a mobile tilter, very versatile and simple to be used. This machine can tilt and empty container octabins into different feedboxes. Because of its mobility, Toppy Octabin can be used also in narrow places. Octabin discharger system is built in the structure of a strong electronic pallet jack, that makes it suitable to handling. Toppy Octabin can feature a vibrating system and a funnel, easing the complete emptying operation. 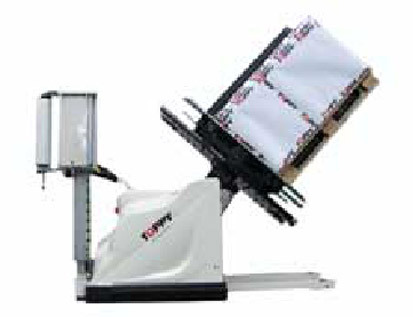 Toppy Inverter is a stationary pallet changer, that will turn loads and exchange pallets on loads of a maximum weight of 2000 Kg and maximum height 2600 mm. The pallets will be loaded and unloaded by fork lift. -	180° rotation for unsteady but not fragile loads (i.e. bags and drums). Toppy Inverter is available with either push button panel (manual control) or PLC (full automatic control). 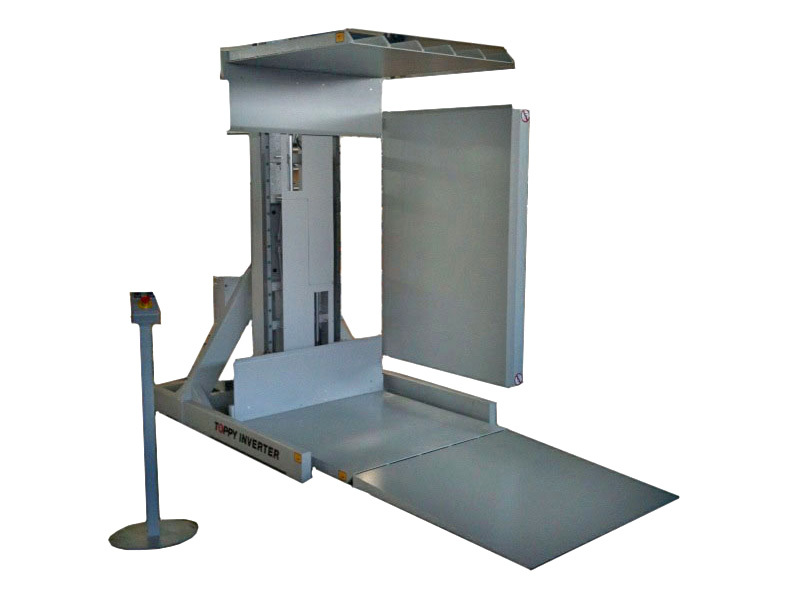 Toppy Inverter Floor Level is a stationary pallet changer, that will turn loads and exchange pallets on loads of a maximum weight of 1500 Kg and maximum height 2200 mm. The pallets can be loaded and unloaded by electrical pallet jack. Toppy Inverter Floor Level is available with either push button panel (manual control) or PLC (full automatic control). 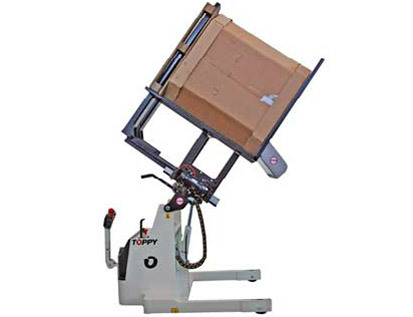 Toppy V Shape 95° is a stationary pallet changer built in a single and strong V Shape frame. 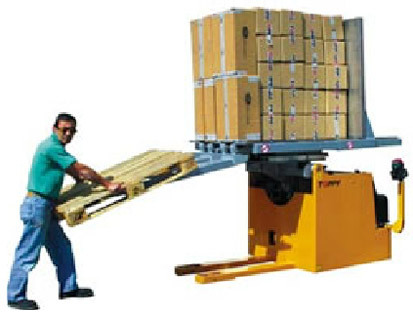 The pallet changer receives the load on its lower platform, placed at the ground level, by fork lift or by pallet jack. At the start of the cycle a pallet latch secures the pallet to the platform and the upper compactor plate moves down until a sensor detects the top of the load. The load, secured by the V Shape frame, is then lifted and rotated by 95° backwards. When the load is in the tilted position the lower platform moves back until to the floor and the pallet is released. 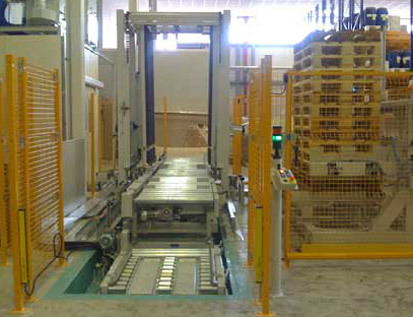 The operator can quickly and easily replace the pallet at floor level. Toppy V Shape 95° can work with any kind of steady product. It is available with either manual control (by push button panel) or full automatic control (by PLC). 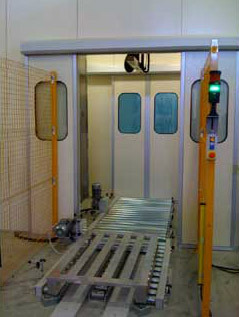 Toppy V Shape 95° pallet changer can also become part of a logistic system, with conveyors and automatic pallet stackers. 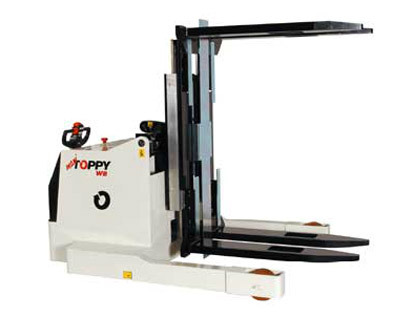 Toppy V Shape 120° is a stationary pallet changer built in a single and strong V Shape frame. 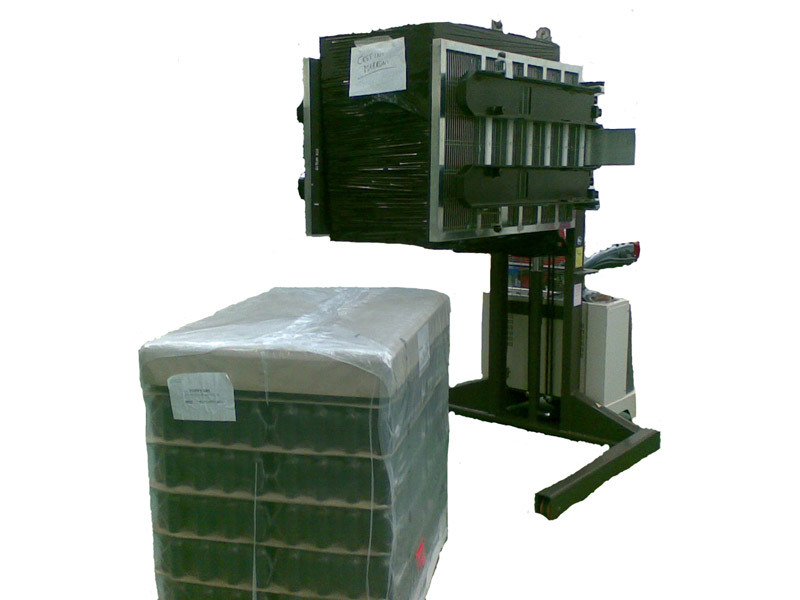 The pallet changer receives the load on its lower platform, placed at the ground level, by fork lift or by pallet jack. 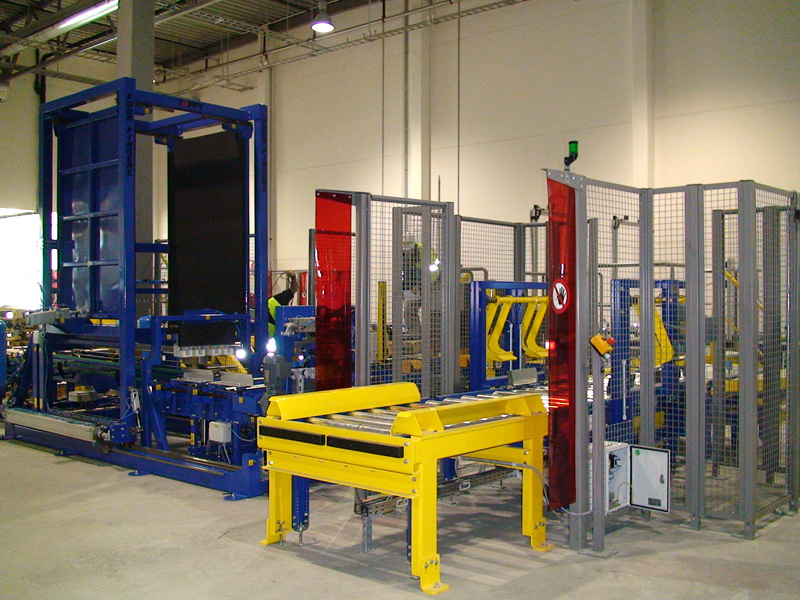 At the start of the cycle a pallet latch secures the pallet to the platform and the upper compactor plate moves down until a sensor detects the top of the load. The load, secured by the V Shape frame, is then lifted and rotated by 120° backwards. When the load is in the tilted position the lower platform moves back until to the floor and the pallet is released. 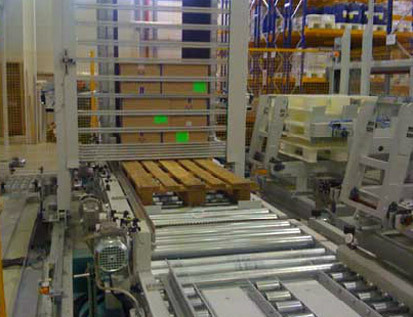 The operator can quickly and easily replace the pallet at floor level. 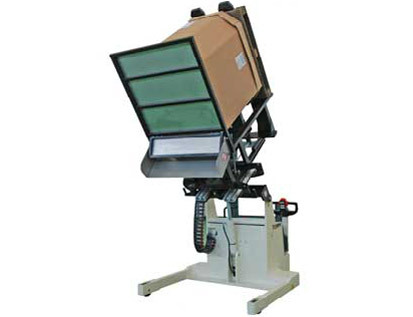 Toppy V Shape 120° will handle several kinds of loads including boxes, bags, vials, drums, bottles, etc. Toppy V-Shape 120° pallet changers are available with either manual control (by push button panel) or full automatic control (by PLC). 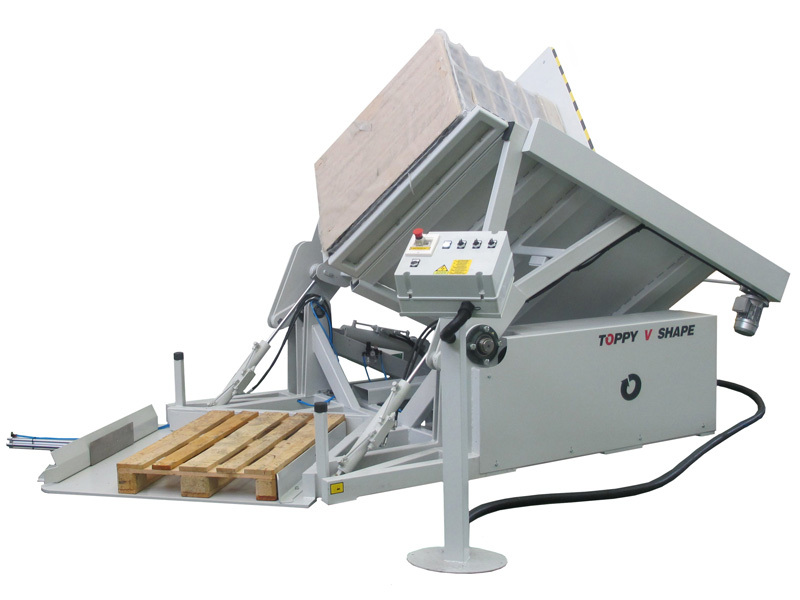 Toppy V Shape 120° can also become part of a logistic system, with conveyors and automatic pallet stackers. 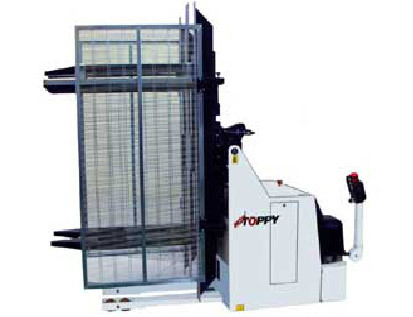 Toppy Four Finger is a stationary pallet changer for the replacement of pallets without tilting or turning the load. The special swords of Toppy Four Fingers are inserted through the Europallet open slots, while two rubber-covered side plates gently close onto the load in order to help support it. The system removes the pallet from below and replaces it with a new pallet. 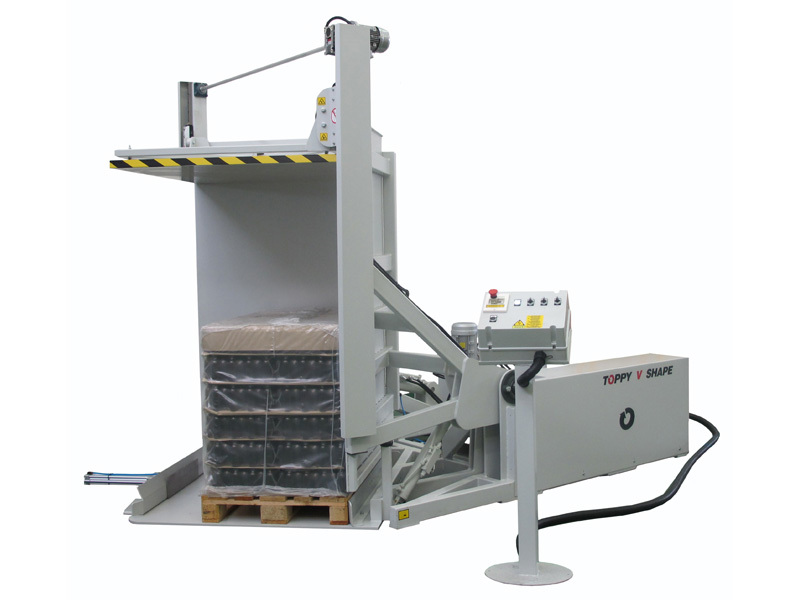 Toppy Four Finger pallet changer are available with either manual control (by push button panel) or full automatic control (by PLC). It can also become part of a logistic line and include automatic pallet warehouses, for an high speed of pallet substitution. 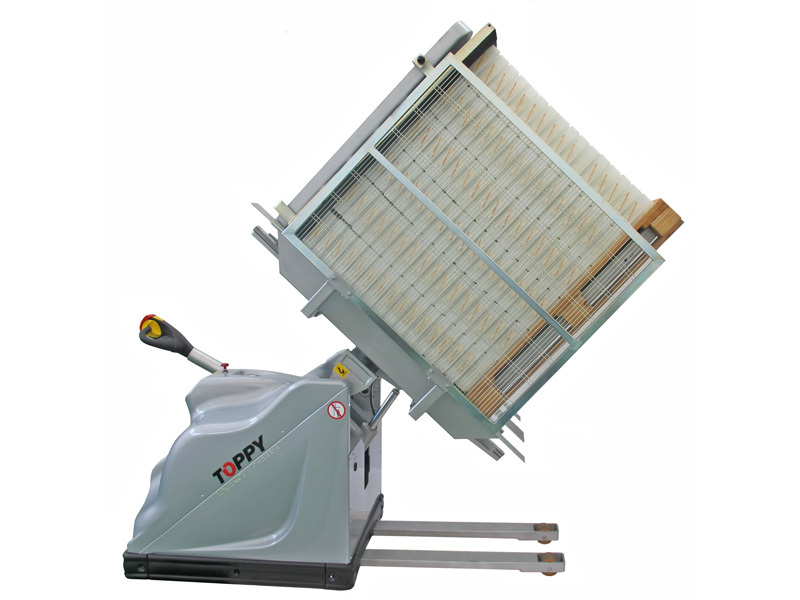 Toppy Master Inverter is a stationary pallet changer for the replacement of pallets without tilting or turning the load, through a translational movement. 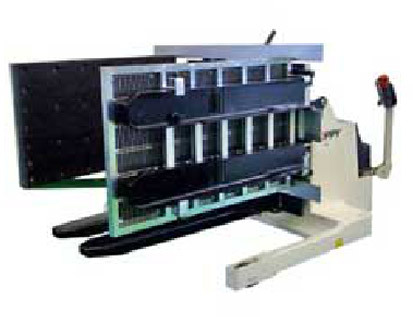 Two rubber side compactors close and support the load on two sides. These plates apply a gentle pressure to the material and, together with a metal back plate, shift the load onto the new pallet. Toppy Master Inverter pallet changer is available with either manual control (by push button panel) or full automatic control (by PLC). It can also become part of a logistic line with conveyors and automatic pallet warehouses. The dedusting cabin consists of a painted steel tubular frame closed outside by stainless steel panels. Two automatic doors controlled by pneumatic cylinders are let open one after the other. The system is completed by filter groups linked to the cabin in a closed path. The powders are detected and purified by the internal depression created by a fan. The air, purified by the G4 and Hepa filters, is sent back inside the cabin. The system features suitable calibration shutters for the adjustment of the aspiration, according to the customer's necessities. 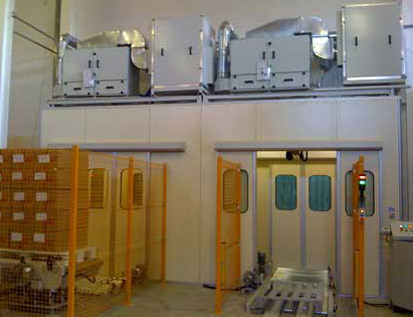 The same shutters create the most proper environment for the right working of the system, with aspired air always slightly higher than the reintroduced air.